Chakra is a Sanskrit word which translates to wheel or disc. 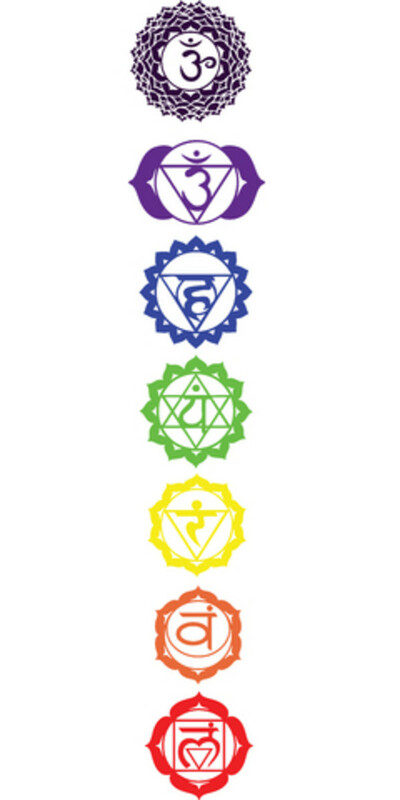 Chakra used in yoga and meditation refers to the 7 centers or points in the body that channel energy or prana. Each point defining a wheel that spins spiritual energy throughout your body. If you are healthy, your chakras are balanced. If you are experiencing health issues your chakras are out of alignment or spinning too quickly. 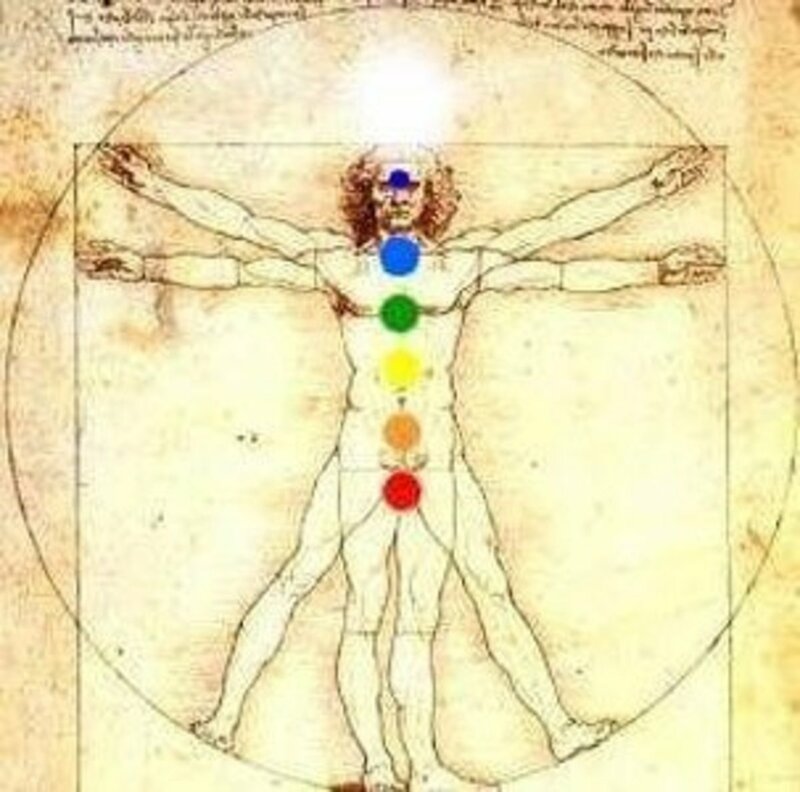 In order to heal one needs to balance chakras. The balancing can take the form of emotional, physical and spiritual empowerment. Healing takes place during and after balancing. The Root Chakra - Muldahara. Its color is red and it is located near the base of your spine just below the belly button. The Root chakra connects you to the energy of the earth. In essence, it grounds you. When unbalanced you may feel anxious or have stomach issues. The Sacral Chakra - Svadhishana. Its color is orange. It is located near the belly button and just above it. The Sacral chakra helps you enjoy life and pleasures like sexual activity. It is a connection to life force energy and creativity. When out of balance you may experience obesity or addiction. 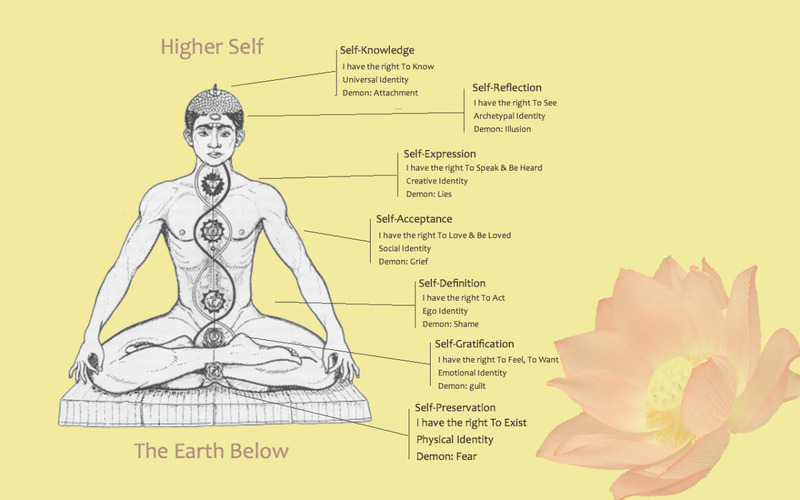 The Solar Plexus Chakra - Mainpura. Its color is yellow and it is located starting at the top of the belly button and extends to the rib cage. It is also called the Warrior Chakra because you get your sense of personal power from the third chakra. When unbalanced you may feel insecure, anger easily or experience appendicitis. The Heart Chakra - Anahata. Its color is green. It radiates from the heart to the throat. You feel love here. Unbalanced you may experience heartburn, relationship issues or circulation problems. 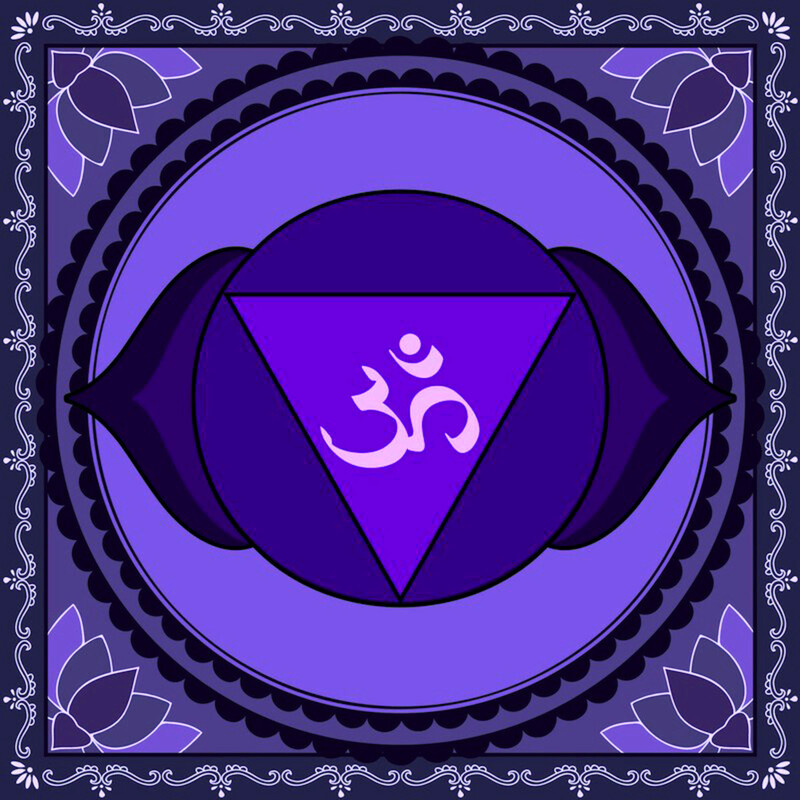 The Throat Chakra - Vishuddha. Its color is blue. This chakra extends from your heart, through the collarbone and to the center between your eyes. You speak clearly and with love and truthfulness when in balance. A disturbance in this area may cause throat pain or a tendency to speak loudly and interrupt others. The Third Eye Chakra - Ajna. Its color is indigo. Its center is between the eyes, however, it radiates down the mouth and to the top of the head. When the third eye is balanced you will feel in tune with the world and experience psychic activities. Out of balance sets the stage for blocking intuition or not receiving spiritual guidance. Allergies or sinusitis may be present. The Crown Chakra - Sahaswara. Its color is violet and/or white. It centers at the top of your head extending outward to connect you with universal energy. A balanced crown chakra is the ultimate goal. It means you have conquered suffering and have become enlightened. 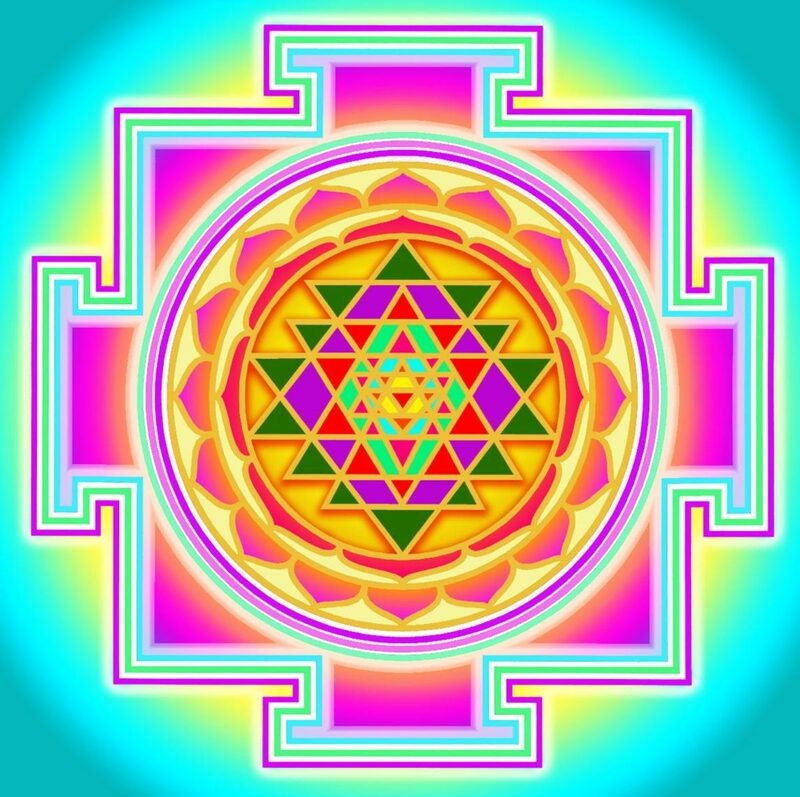 There is no unbalance in the 7th chakra only underactivity. Focusing on spirituality and the other 6 chakras will bring you closer to enlightened consciousness in your crown chakra. Balancing chakras that are out of sync will promote healing and alignment with the other chakras. Balancing also brings you closer to the ultimate goal which is to reach Nirvana. Balancing chakras may seem to be other worldly and difficult but rest assured the opposite is quite true. Balancing your chakras will bring joy and fun to your life, offer you a sense of peace, connect you more deeply with intuition and help you to have more meaningful personal relationships. Chakra balancing may also help to alleviate health issues currently plaguing you. Follow these tips to begin the chakra balancing process. Balancing the Root Chakra begins with easy connections to spirituality. Prayer and meditation offer a way to calm the Root Chakra when you experience jitters and anxiety. Pour your excess energy into volunteer work or acts of compassion to re-route excess energy to the other chakras. If you feel unable to concentrate or not clear headed, your Root Chakra needs an energy boost. Connect to the earth when you feel this way by taking a walk, digging your toes in the sand and literally stopping to smell the roses. Your Sacral Chakra is overactive if you experience addiction, restlessness or gluttony. Imbibing rather than nourishing the body has harmful effects. Calm and balance the second chakra by taking the time to ask yourself if what you are about to do or consume is good for you. Draw over activity towards the heart and seek love to calm your restlessness. Focus on a healthy attitude to heal. If you are experiencing a lack of sexual energy or depression, it is possible that your second chakra is under active. The steps you need to take to balance this under activity are to focus on creativity and the pleasures of life. Talk a walk through a museum, spend time caressing your lovers body or enjoy the simple pleasures of tasting a freshly picked berry. Return to the roots of pleasure without overindulging in order to energize the Sacral Chakra. An overactive and unbalanced solar plexus feels like the need to control others. Anger is present and you may feel no empathy towards others. Physical ailments include digestive issues and problems with the other internal organs including the liver and kidneys. For balance, seek to find love and share it with others. Meditate to turn that need for control and power into rays of love and light. Under activity in the solar plexus leaves us feeling needy and insecure, the opposite of the control freak we become with over activity in this region. Energize the solar plexus with activities that you are good at and experiencing those activities with others. Meditate with personal affirmations that empower and strengthen you. When the Heart Chakra is overactive you are feeling the need to put others before yourself. Your heart is racing and you may be experiencing palpitations. Correct this by taking time for yourself. Relax in a hot tub, get your hair styled and meditate to bring compassion to yourself. Do this everyday. When under active, the Heart Chakra is difficult to energize. You may have spent years putting up walls to keep people from getting close to you, it will take time to tear these down. You can lower your defenses and energize the Heart Chakra by loving yourself and sharing that love with others. Appreciate yourself and see the same in others. Wear green the color of the Heart Chakra, let this color remind you of the love you have for others and forgive those who have hurt you. 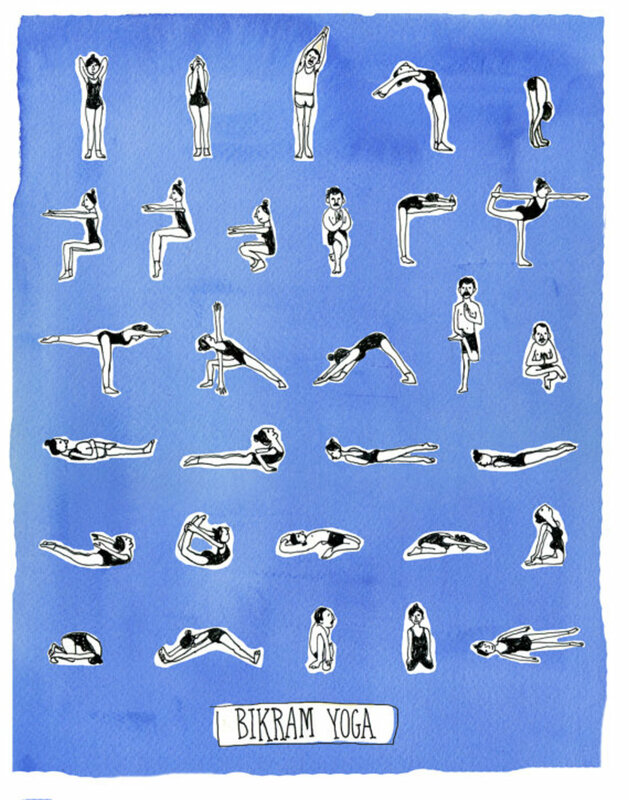 Try the camel pose in yoga to energize this chakra. When you are being ignored or are struggling to make your opinion heard, your Throat Chakra is overactive. Ulcers present themselves with this over activity. Balancing your Throat Chakra is easy, think before you speak. Wear a blue necklace around your neck to aid in this balancing. An under active Throat Chakra expresses itself when you are commonly called a “shy” person. Break out of your shell by singing. Turn up the radio and belt out a song when no one else is around to practice having your voice heard. Energize the throat with a neck massage. Meditate while visualizing a blue light cooling and warming the area of the Throat Chakra. Intuition and psychic energy come from the third eye. To say that your third eye is over energized or under energized might mean very little since it is uncommon to trust intuition and psychic ability is sometimes seen as far fetched. An overactive third eye would have you experiencing paranormal activities while an underactive one is common. We do not value psychic ability in our society as a whole. To energize the third eye practice meditation and learn to trust your intuition. 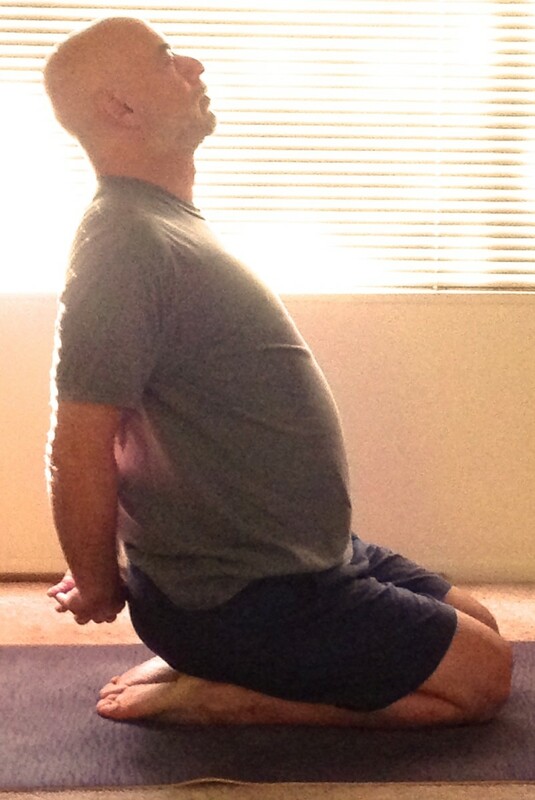 Child’s stands and forward bends in yoga poses will help to balance your third eye. The crown chakra is your connection to the universal spirit. 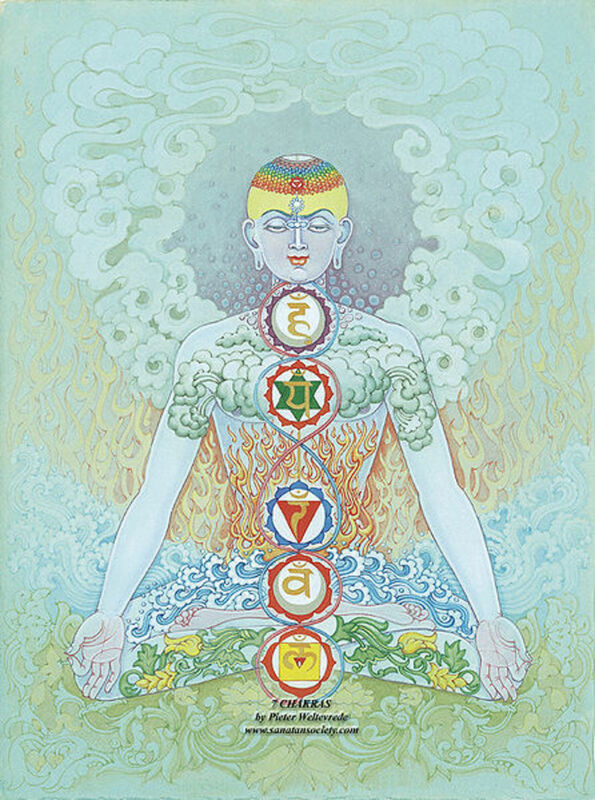 The focus should be on balancing your other six chakras in order to maintain even energies throughout the body. Daily prayer and meditation will keep you connected to this universal energy. 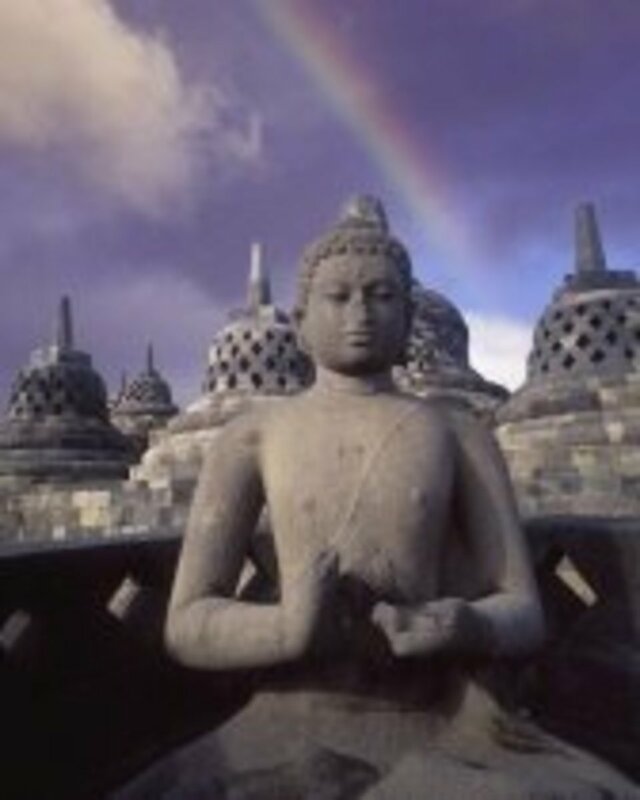 Opening of the Crown Chakra is enlightenment. Healing instead of balancing sometimes requires outside assistance. If any physical symptom associated with an unbalanced chakra causes pain or uncomfort, seek medical assistance. Balancing will offer you joy, pleasure, peace, and harmony while using the techniques provided by your medical practitioner to aid in healing.